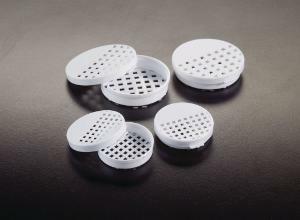 The lids have a frosted marking area for sample identification and an open mesh area to facilitate fluid exchange. The whole surface of the base is also an open mesh. The lid snaps securely on the base, eliminating the risk of tissue loss during processing. Color: white.